Who's with me...... there just isn't enough time! Since you last saw me I have kicked up my crunchy business; added bee products to my line; became one of the admins in a co-op I was part of and generally been living a every day is full life. After all when you have 2 businesses, run an entire household, have big admin roles to fulfill, try to grow 500 lbs of food in your garden per year and have your 3 year old doing it all with you....well you see where it is going. So I just wanted to pop in and say yes... I will be back. SCHEDULE SCHEDULE SCHEDULE! I will work on it and be here to see you soon. My Thanksgiving Tradition ....year 2! So with Thanksgiving fast approaching next week everyone is getting their guest list finalized and their menu dialed in. I must say, I came up with a new family tradition last year and plan on sticking with it, well...forever! My guest list consists of nobody and my menu consists of nothing! How can that be you ask? Let me explain. Since the birth of my son I never have a day off of HAVE TO's. Even on the most fun days it is full of have to's. When Thanksgiving was rolling around last year we were going over our invite options and looking at nap schedules, eating schedules, etc it just seemed like so much more work to even go to someone elses house for Thanksgiving. That is when the brilliant idea struck. How about we don't go anywhere, don't see anyone, don't do anything and don't really eat! Perfect!!! Here is the breakdown. I do pretty much all of the cooking at my house, so come holiday meal time.... it's me! I do all of the shopping, I do all of the planning, you see where I am going. Not to mention I run two of my own businesses, all of the accounting and office stuff for the dudes business, most of the big boys everything, most of the house stuff and lets just face reality run the whole deal! You know how it is. So last year I grabbed some great food, and just put it out in case anyone got hungry. It is amazing how you can live off super yummy finger foods all day long. The best part was I considered it to be my first day OFF all year. Needless to say, next Thursday will be the first day off since LAST Thanksgiving! So you are understanding why I am loving the new tradition! Hang out, maybe bike ride, maybe the zoo, maybe Fiesta Island with the dog.....maybe none of them. What about the food you ask. It's just food! If we had gone somewhere I would have to make the meal later in the weekend anyway so we can have leftovers. Saturday or Sunday I will be skipping the turkey and fry up some chicken, do some twice baked sweet potatoes with walnuts, a huge fab salad with some fresh dressing, some hot sauce, pepper jack cheese bread and call it done. I will spend the Thursday being THANKFUL for what I have, who I have and what I can do with them. Great family traditions that work...THAT'S what's for dinner. How to prepare for Black Friday shopping! Okay... I LOVE a deal! Plus I appreciating getting the biggest bang for my buck. That being said, sometimes I am not finished shopping come this time of year. I do have a handful of gifts yet to get so I am prepping with the black friday momentum. Who else does this? Sure there is a certain level of crazy, have to get in line, the crowds, the check out lines, the traffic, the limited number of items, the middle of the night, the this really isn't worth it realizations that have come to be associated with black friday shopping. Now here is the thing, come Thanksgiving I want to relax. Last year I decided to make a bunch of food that we could graze on throughout the day. This year I am doing the same as I decided that is our new tradition. I am taking the day off from working other than making a baked brie! :-) So the idea of scouring through the paper in search of fantastic deals then coming up with a game plan and strategy has simply no appeal to me. I do however want some of the good stuff. So what to do. Well in case you don't know there is actually a Black Friday website. It releases ads early! A friend told me about this site maybe five or so years ago. I have been doing my planning for 2 weeks now. What is even more awesome, you get to see who opens when, what deals you can get online AND you have time to think about it vs. having the shopping panic and then ending up with a bunch of stuff you may have not REALLY wanted to get. We have all been there, you find a deal, get it...wish you really hadn't... too much of a hassle to return it.....give the gifts, pushes you over budget and vow to not do it again next year. Yes my friend, I too have been there! You will have time to figure out when you need to be where if you do indeed have to leave the house, but I much prefer the midnight deals online when I just walk into my office, order them, have them shipped to the store or pay the nominal holiday shipping vs. all of the yuckiness to get the stuff then standing in line for 1.5 hours. So do some research, make your list, shop online, buy unique gifts, have fun and remember this time of year is supposed to be amazing, not stressful! Just like everything else in life...having a good plan is key! Happy Black Friday! Now when it comes to kids clothes I happily report that I have purchased 1 item for my 3 year old at full price. I figure he grows so quickly and he tends to be ALL BOY that some items get thrashed pretty quickly, why should I pay full price. That said I have also bought ahead because as a tiny little one he was a BIG boy. Rather than milk I made cream. From the time he was 1 to 2 he gained 2 lbs…… that tells you what a little chunker he was. Back then I had no idea that once he grew some he would be a lean and muscular 2.5 to 3 year old……. Normally I would hit the deep discount stores and was fortunate to stumble upon some store closures. Twice I have seen $5.99 stores closing and was able to get lots of Baby Gap, Tony Hawk, and Quicksilver shirts for $1.99 to $3.99. Not bad. I did have fantastic luck with the Target clearance schedule. I have a pretty close Target that had a lot of clearance, then they remodeled. After that, basically no clearance. I have not shopped Target in over a year. A great time to shop online is Midnight Thanksgiving night. Another fantastic online shop I had was Old Navy about January 3rd. I came across TONS of clearance items. I got free shipping and got 24 items for $46. Now I have never gone to a resale shop…..BUT I have gone to the kids resale event called Just Between Friends. I went six months ago ( they have them every 6 months) and found a handful of items for the like price. I decided I would sell some of Kash’s items at the sale this time around. As a consignor you get 60% of the sale price. You can donate the items or go pick up whatever does not sell. An even more exciting part of this event is that if you are a consignor you get to SHOP EARLY!!!! The event is a 3 day sale. The first two days are regular sale days and the third is a half price day. I did not go the first day, but I took advantage of the half price early pass and went after the regular sale had ended the second day. 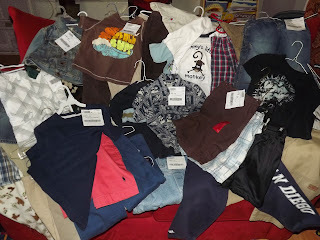 I have to tell you…… I honestly do not think I will shop retail for my son again! The items go through an inspection process so everything is great. But you can still be choosy. In about 45 minutes of shopping and very through checking of all my items I walked away spending $81.27 for 39 items. 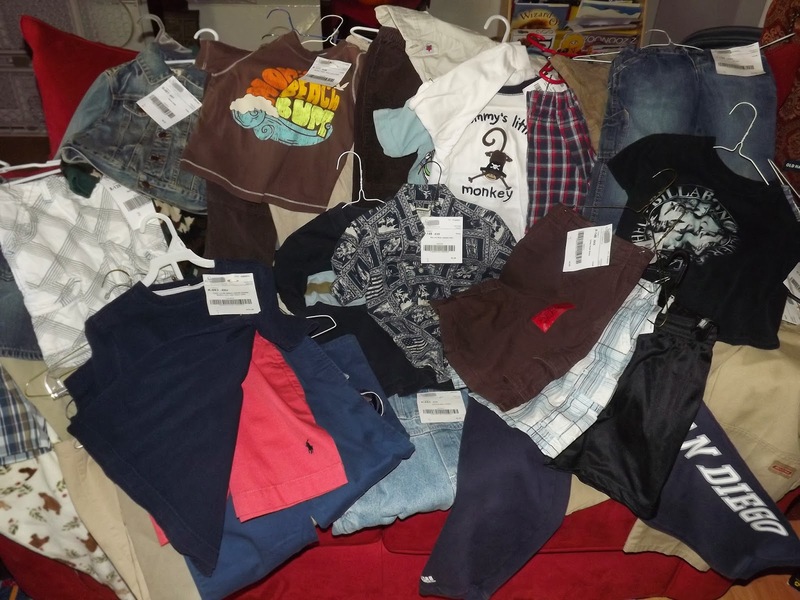 They are all Gymboree, Oshkosh, The Childrens Place, Baby Gap, Dickies, Ralph Lauren, Nautica, Billabong, Levi, Lillian Vernon, Airwalk. AMAZING!!!!!!!! Now it looks as if I sold around $65 worth of items. I only had about 40 items that I offered up for sale and came home with about 12. I will just leave them as is for the next sale and add to the pile. Up to this point I had always just recycled our baby items and given them to people who had a boy who was younger than ours. I figure I can still do that with some of our things, but I can certainly offset my sale purchases with my sales revenue. So with what I will get from my commission I will essentially have purchased each item for about $1.50. Once again AAAMMMMAAZZZIIINGG!!!!!! 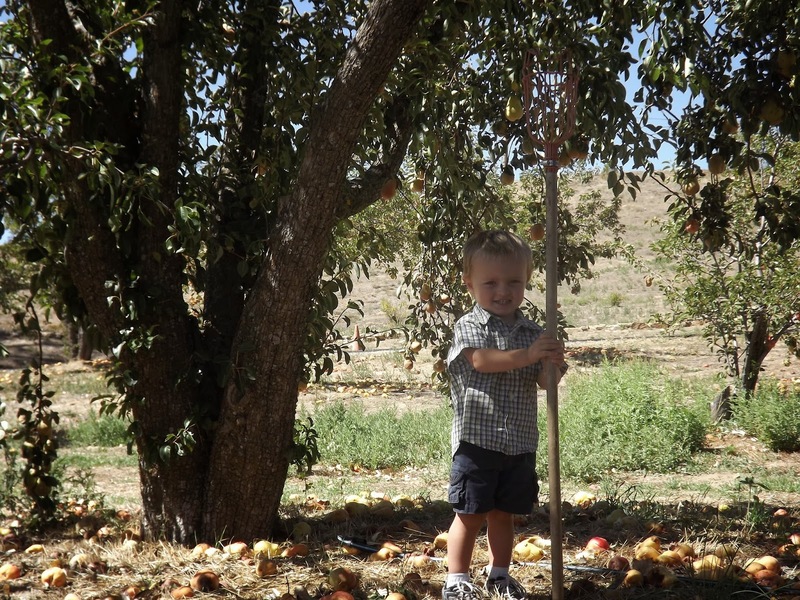 I have lived in San Diego my entire life…..and NEVER gone apple picking! You would see things on the internet or in the news and it always seemed like it was basically one weekend and EVERYONE would infiltrate Julian, pick the apples and that would be it. Turns out it is actually a few weeks long AND there are more things available than just apples. So I picked a day and off we went. 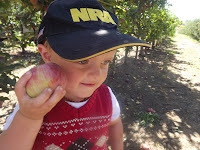 We went to a pretty popular farm that used to be an apple pie farm, the way the price of produce shook out they could not even pay the labor for what a case of apples was going for. So they sold the farm. The new owner switched over to organic practices and opened as a u pick. 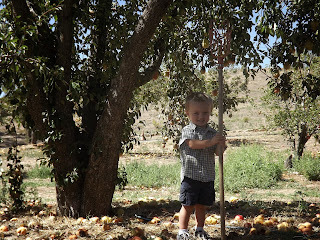 Don’t get me wrong, the apple picking was fine. 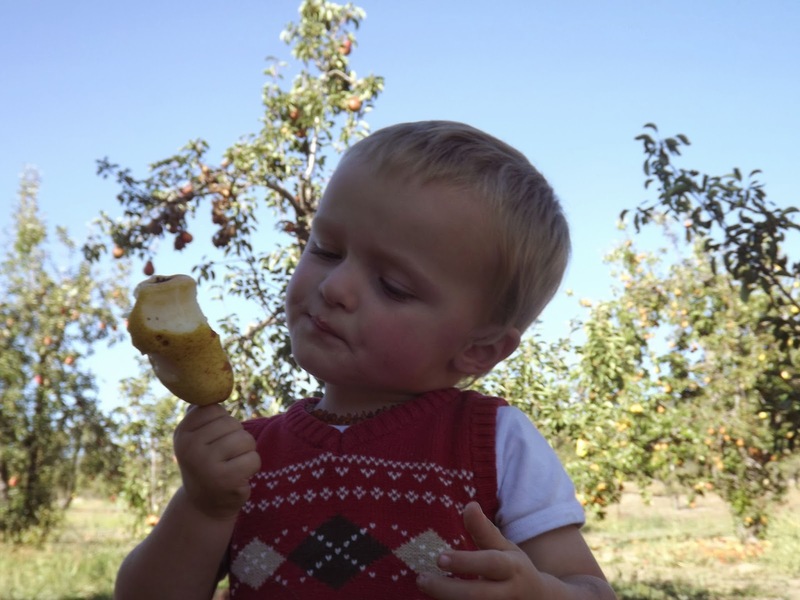 We were not huge fans of the variety of apples available that day but we were able to pick a bag of empire apples in no time. The farm wasn’t too busy and was set up like a winery, so it was pretty easy. After the whole drive to get there we wanted to explore a little more so we were actually going to go to the winery down the road when we spotted a sign for an organic pear orchard. So we drove in. Now this place was DIVINE! There was one other family there when we arrived, rather than having someone standing there at the gate ready to take your money for a picking bag…. I had to go down to the other family there and ask them where they got their picking bag. The answer… just go up to the house and yell if the dogs don’t tell them you are here. So that is what I did. This farm used to be a Whole Foods supplier until they tried beating them up on the price. He hung up on them, opened up his coolers and never picked another pear. Instead that is when they opened up for u pick. 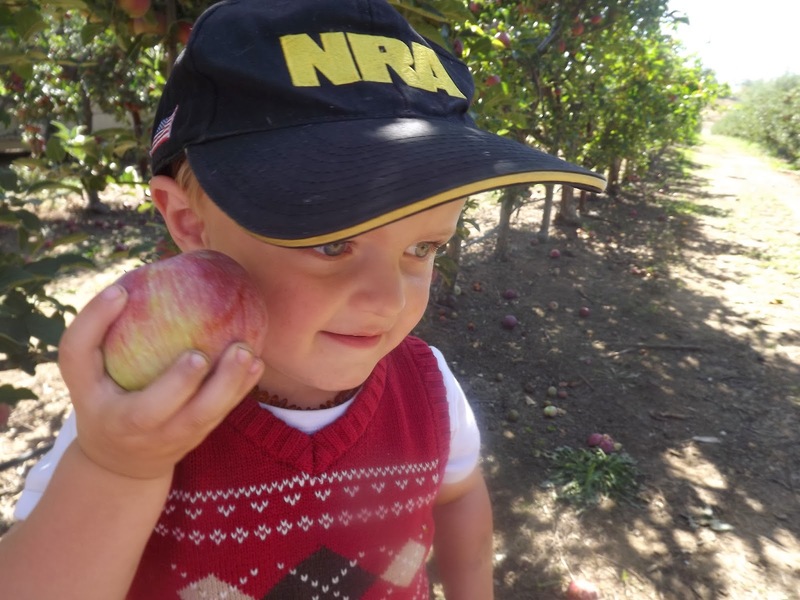 They have turkeys, chicken, goats, horses and a beautiful orchard. They make goat cheese and fabulous goat’s milk soap. 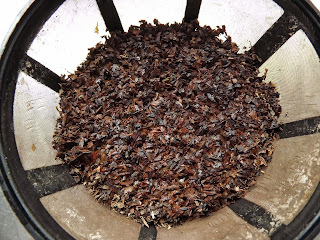 With our beautiful pears I made a huge batch of dried pears, 3 full dehydrator batches. Pear Ginger Applesauce (this is a fantastic thing!) We juiced some with apples and ginger and they were amazing; I made a big batch of Pear Butter and a lovely Pear Vanilla Jam. 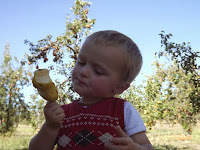 So if you still have time head on up to Julian and be sure to hit the O’dells Organic Orchard. If you can’t make it now be sure to put it on the calendar for next year. It is AWESOME!!!!! this was when it was all steamy in the crock pot! 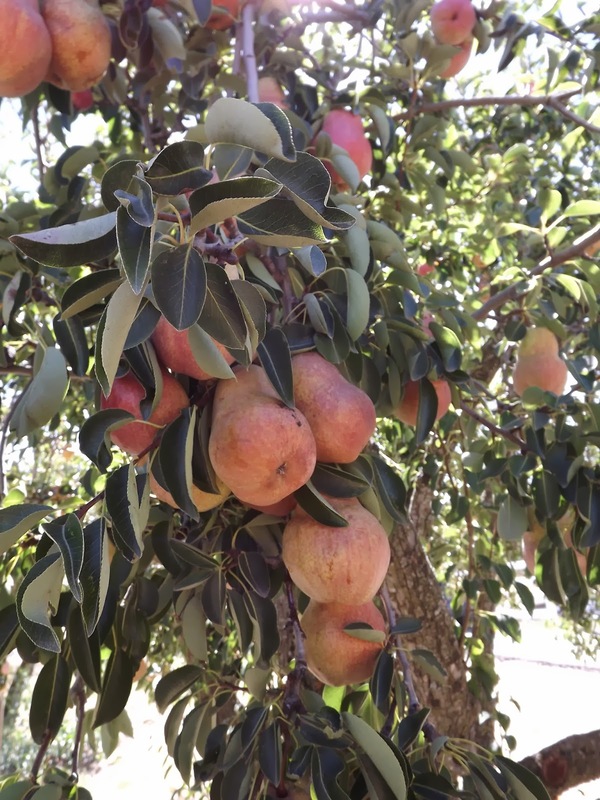 Peel, quarter, core pears. Put into a large pot. Add all spices, sugar and water. Bring this mixture to a boil then let simmer 20-30 minutes. At this point the pears should be a little soft. Transfer the mixture to a crock pot and put on low for 4 hours. After about an hour or two grab a potato masher or immersion blender and get them a little smoother. Then just enjoy the smell, it will become super amazing and if you are not sure, leave the house for half an hour then come back in to smell deliciousness! As you approach the 4 hour mark get your canning supplies ready and be sure to follow safe canning practices. This recipe will make just over 4 pints. I canned mine in 8 half pint jars and probably could have stretched it into 9, but instead I just put the extra in a bowl and we ate it! If you have never tried Kombucha, well you should! This stuff is awesome. If you are a farmers market shopper you may have tried a sample from an overzealous vendor or gotten some misleading information that caused you to think "okay...". You see in the world of fermentation there are a lot of misleading/confusing things that happen due to the different levels of information people have. 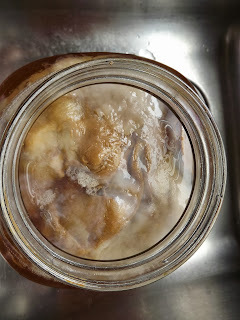 Mushroom, Mother, Starter.... theses are all terms that people use for the SCOBY. Well what is a SCOBY you ask. Symbiotic Colony Of Bacteria & Yeast. Now that makes more sense! This is the little magic jellyfish like blob that turns your tea into kombucha. Now it's time to get started. *Boil some fresh water and brew your tea. I use just 3 cups of water in this process....the tea will brew no matter what, just use enough tea for a gallon. *fill your jar 3/4 of the way with COLD water. *once sugar is dissolved add the tea into the cold water. *cover with a towel or coffee filter. at day 5 start tasting the tea......if it is still super sweet it is not ready, every day it will become more tangy, so be sure to stop brewing when it is at a tang you like. Time to pull your SCOBY. You can leave the new little baby attached or separate them and start a SCOBY hotel. Google that to find out how. You will take 1 cup of tea and put it with each SCOBY. That becomes your 'starter tea' that you use with your next batch. Now it is time to flavor it. My favorite is lemon ginger. But the possibilities are endless, so think about what you like and go from there. I use 2 fresh lemons, squeeze the juice in. Slice up about 1 inch of ginger and cover with a lid. Let ferment again for at least 24 hours. If it is airtight it will also start to get fizzy. Strain out your fruit or herbs and then refrigerate OR add to pop top bottle and leave on the counter for another 24 hours to really get fizzy. Why drink Kombucha? It is FULL of probiotics and detoxifying properties. 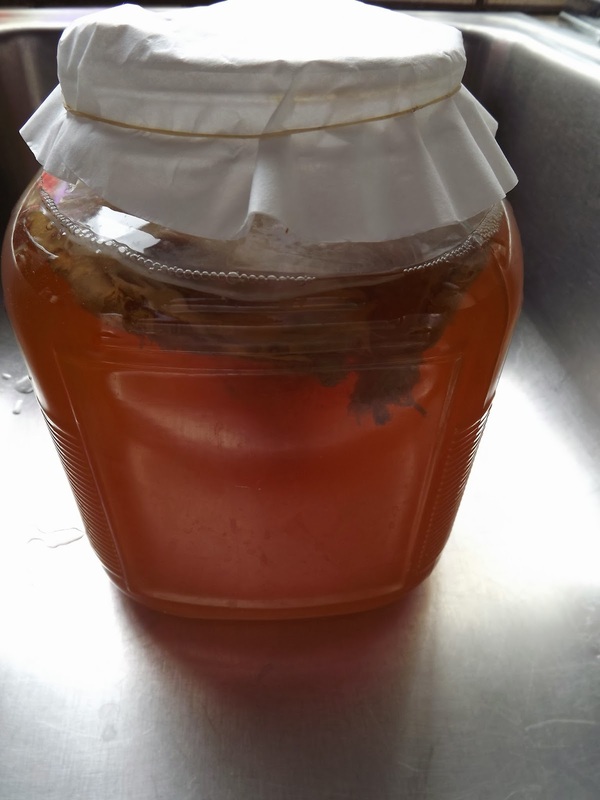 Throughout history there are claims of it being a cure all, some of my client friends who have purchased SCOBYS have said when they start feeling ill they drink their kombucha and within a couple of hours... all better. Regardless, kombucha is a great fermented food to add to your home, it tastes great and makes you feel good. Give it a try... super easy! and way less expensive than the $4+ you pay in the store! - if you want to decaf it, use 1 cup of hot water on your tea, let it steep for 1 minute, pull the tea and toss the water then brew accordingly. Most of the caffeine is released in the first 30-60 seconds of brewing. So I have not posted anything for a few weeks. Guessing you can probably tell by the title why. August 17th we lost one of our good friends, we have known our friend Craig since we were 15 and 19 respectively. And how cool is that to know the same person once we got together. Over the years Craig has been a great friend to our family and has provided our son with 2 of his favorite things. One was a helicopter that Craig brought him for his frist birthday and the second, so much sand that we had to make a sandbox. Anyhow skip to August 22nd, this is the day we found out as his family had discovered what had happened the evening before. Not only are you dealing with your emotions, you are dealing with your spouses emotions, you are full of questions as to why someone who is 47 is no longer here...then it hits you. What am I going to tell this little 2 year old in the back seat. All of a sudden as we pulled up to the house I realized I needed to say something as my emotions were all starting to surface and I knew things were not going to be easy once we saw daddy. 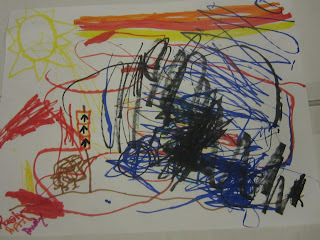 So this is how it started: "when we go into the house we want to give dad a big hug because he is going to be sad". 'why is he sad mom?' " I am going to tell you that while I get you out of the car" -hoping that the few seconds it took me to close the door and walk around to the other side would bring me an Epiphany- "You know our friend Craig" 'yes' "he died. Do you remember what that means?" 'tell me mom' "It means we won't get to see his body anymore and he is going to become a fossil" That is when daddy showed up as he wanted that hug. And just like that the understanding of death began. Over the next couple of weeks he watched as we lived through our emotions. He would ask us questions and we would answer them. We talked about angels, we talked about bodies and spirits. We talked about pretty big life stuff that so many people as adults don't always deal with well and he processed everything in amazing fashion. Craig doing a wheelie in his blue & black riding gear with his bike getting dirty from the sand with the sun & a sunset. Great 2 year old decisions for a pic. He was the only child at the funeral. He gave Craig's sister the picture he drew for Craig and told her about what he had drawn and why. As far as I know this was the only thing put in the coffin with Craig and I'm sure it made him so happy that this is what Kash is thinking of when he thinks about him. He was a great little boy and even though it was an incredibly hot day he did a fantastic job. He told his dad what a good job he had done after he was done speaking and as things were wrapping up something amazing/unbelievable/ heart warming...I'm not quite sure what the word is to describe it, happened. I had walked him to the end of the cemetery to go look at all the horses at the horse farm next door. As people and cars started pulling away he turned and looked back toward the grave site. Keep in mind we never went over specifics as to what happens when someone dies. As he was looking at the site he said to me 'mom I want to go watch them put Craig in the ground' And so we went. We did stop at a tree on the way and sat in the shade for a few minutes while the rest of the people left, we got up as one of the family cars drove off and we saw the grounds keepers start making their way down the hill. When we got back over there the remaining family members said they were leaving as they did not want to witness what was going to happen next. Andy agreed until I told him what Kash had said. So we waited for the family to drive off, gave the men a nod, watched them put our friend in the ground and walked over to say goodbye. Last Friday there was a party to celebrate the life of our friend. 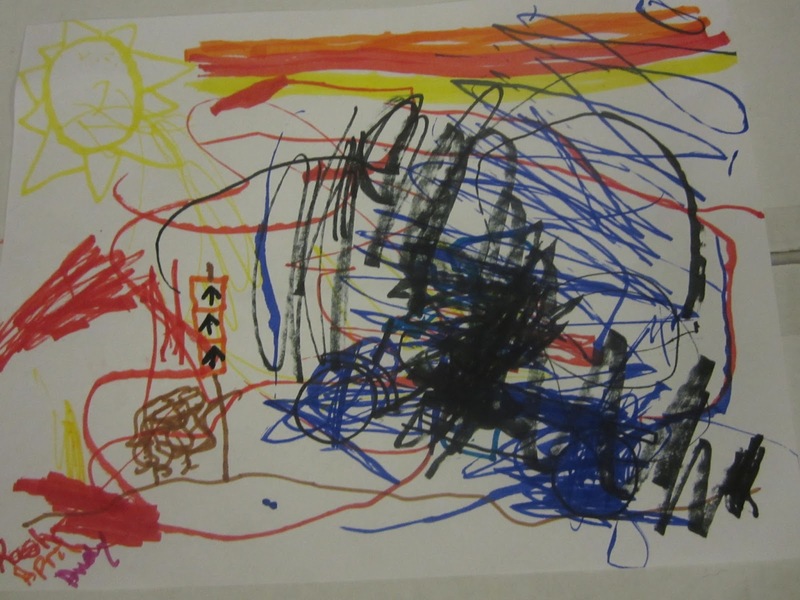 Kash called it 'Craig's party'. The next day he talked about how Craig's party was 'nice and fun and it made Craig happy but Craig wasn't there'. Tonight I walked in the house after cleaning up dinner outside and he was saying 'we're sad because Craig is a fossil now and we no see him anymore'. There are other amazing things that have happened over that last few weeks but I won't go into all of it. One of the things we always try as parents is to do the right thing, help our children and guide them. 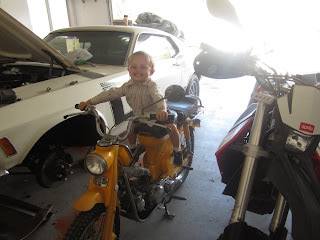 Never did I imagine at 2 I would be explaining death.... but one more thing I have to be thankful to our friend Craig, you helped me teach our son about death, bodies, spirits, how they all work together and brought him an amazing understanding. We will miss you, miss all of the adventures that were to come, but know that you are always welcome for a visit!